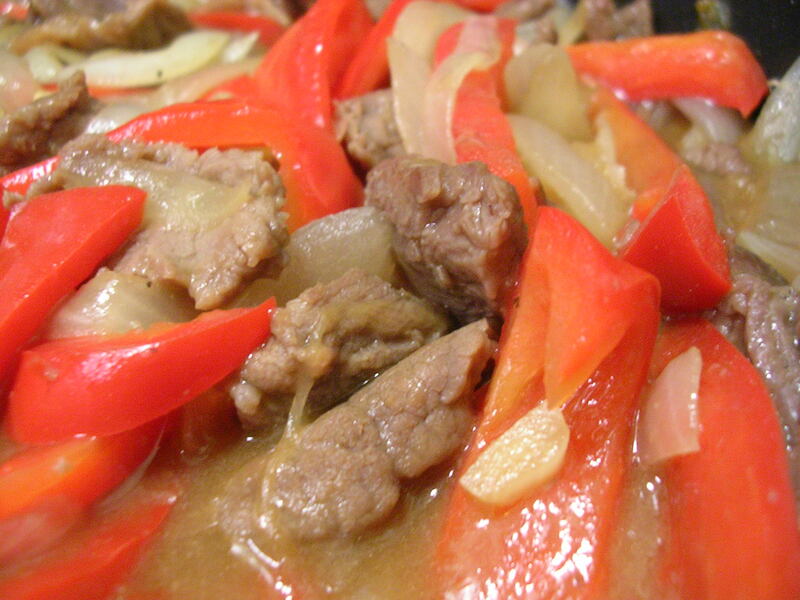 Dinner tonight was a delicious Chinese style pepper steak beef dish that I helped my boyfriend make. It's one of those popular choices at Chinese restaurants that costs a small fortune compared to other dishes. I guess it's just because of all the beef. Well it's actually really simple to make in the comfort of your own home, and I guarantee it's less greasy and salt/MSG-laden than any restaurant takeout. We had ripe red peppers on hand, so that's the kind we chose for this dish, though I think having a mix of red and green peppers would have been great for color and taste. We used 2 large red peppers, 2 medium sized onions, and about 8 oz. of lean beef. While Greg sauteed the onions and peppers until just tender, I cut up the beef into thin slices and marinated it in a combination of salt, sugar, white pepper, black pepper, rice wine, cornstarch, soy sauce, and oyster sauce for about 10 minutes. Then the veggies were set aside and the beef was seared and flipped to cook through before incorporating the vegetables again. Finally, we added a sauce made from about 1 cup of water, 1 tbsp cornstarch, and 1/3 cup of oyster sauce all stirred together. Once the sauce started to bubble and thicken, the dish was ready to serve. See? Pepper steak beef isn't so tough to make after all :) It went really well with some piping hot white rice, especially because it's quite cold in Boston nowadays and our dorm's heating isn't working. I loved the balance of saltiness from the oyster sauce and the meat with the distinct tangy flavor of the peppers and the subtle sweetness from the onions. And the best part is that there's enough leftovers for lunch tomorrow! This entry was posted on Sunday, October 14th, 2007 at 5:06 am	and posted in Chinese, cooking, Uncategorized. You can follow any responses to this entry through the RSS 2.0 feed. Could you send me the recipe for the Shanghainese red braised pork?